I have always wanted to go to the desert. Turns out, it’s not far from San Diego. And so, a little while ago, a spontaneous weekend getaway to California’s neighboring state Arizona was on the agenda. We hopped in the car, and off to the desert. Now, I had never been to AZ before, but was told that, especially during the summer, it’s super hot. Well, duh, summers in southern California are warm. Right? Right. And of course I know it can get hot. Well, but let me tell you, I should soon come to realize what hot in Arizona means. …until we reached the border - where we actually had to stop and were being asked questions. We continued cruising through the ever-changing desert (I didn’t know deserts could change their look several times), and eventually drove into the sunset. A car here, maybe one there, but on this route, there’s no continuous traffic. You just pass a few cars. We stopped, half way, in Yuma, to get gas. HOLY SMOKES, people. You might not understand what this meant for someone who generally doesn’t consider freakin’ heat (like…heat) their friend. Not thinking about what I was doing or generally not thinking about anything that particular moment, I opened the car door to step out … just to enter a Finnish sauna. No joke, this is what it felt like. The wind was hotter than my blow dryer (yes, it did feel like it), and I thought I wasn’t gonna be able to breathe. This is when your bf goes: “Duh, I told you it would be hot.” – and I now knew what hot in the desert actually means, as opposed to San Diego. Honestly, this was quite the experience, not gonna lie. We then had a pit stop at McDonald’s, and we could barely open the door, as the metal was so hot. The wind was blowing and with it, the fine sand had already made its way into my eyes and nose. Woooohh, this European redhead over here found herself in a completely new world (which might be the order of the day for so many people out there). We eventually continued driving and I realized what it would mean to spend a weekend in Phoenix. Sunsets on the road, in the middle of nowhere. Quite the American thing if you ask me. After about 5 and a half hours, we arrived in Phoenix, long after the sun had set. We were welcomed warm-heartedly by friends and headed out for late dinner. The next day - another hot one, oh boy -, Scottsdale Old Town was on the agenda. Scottsdale, located east of Phoenix, is a, let’s call it, “wealthier” part. Leaving the A/Cd car behind, we rolled out into the sunshine to explore Old Town a little. Western feel at its finest. There are cute little shops. Western vibes definitely await. Even with 109 degrees, these people don’t lose their humor. Impressive. 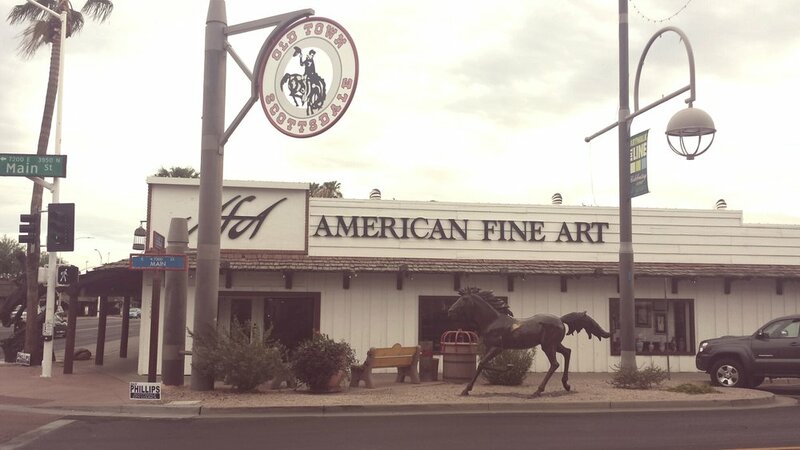 We walked crawled around Scottsdale’s quaint little Old Town (hey, every step was a sweaty affair) and I started to feel as if I really was in a Western movie, in a ghost town: basically no on was out, two thirds of the shops and cafés were closed. I soon came to realize that the peak of summer doesn’t mean high season here in Phoenix, on the contrary. Winter is when the temperatures get more comfortable and people can actually spend time outside. And so we wandered around town for roughly 30 minutes before this heat - for someone absolutely not used to it - got slightly too much for me. However, I loved strolling around Scottsdale’s Old Town. I can only imagine that it must be buzzing when the temperatures drop in late fall / winter - just like now. I actually checked the weather forecast yesterday and with 72 degrees, this is going to be absolutely perfect weather. Desert temperatures can be so extreme. I cannot wait to head back to this area over Thanksgiving. It will be a whole different experience. I am actually packing layers and a thick scarf, because in the evening, temperatures drop to below 50 degrees. Getting real cold there (haha). I spent a lovely three days in this city, although the majority of the activities took place in air-conditioned places. When we headed back on Sunday, we stopped at Dateland. Yes, this place is rather popular - and dates are a thing. And they have the best shakes, so of course we couldn’t resist a pitstop. They even have little pet facilities, so your four-legged friends don’t get too hot in the car when you enjoy your ice cold shake. …seeing the changing desert landscape on the way back home. The changes are significant - and absolutely stunning, at least I think so. And shortly, I will be back on the road - Arizona bound for Thanksgiving weekend - Phoenix and Sedona are on the agenda. I am bouncing up and down with excitement. On top of all this: It’s my first Thanksgiving ever. I’ll let you know how I experienced it. Have a wonderful, safe, peaceful Thanksgiving weekend.